The MaxLife external compensation technology continuously measures every pixel in the display and compensates for even the smallest shift in performance (due to burn-in or bad manufacturing issues), making it completely uniform and completely stable. 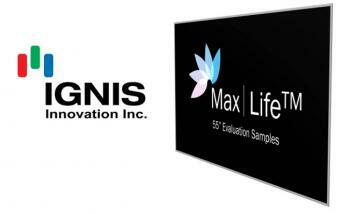 MaxLife can work with a-Si, LTPS and metal-oxide backplanes (the 55" panels produced now use a metal-oxide backplane). Besides the benefits listed above, Ignis says that MaxLife will improve production yields (and so lower production costs) and also offer an easy migration to high resolutions (UHD) due to the simple pixel design.